This article was written by the High Point Enterprise. To view the original article, click here. 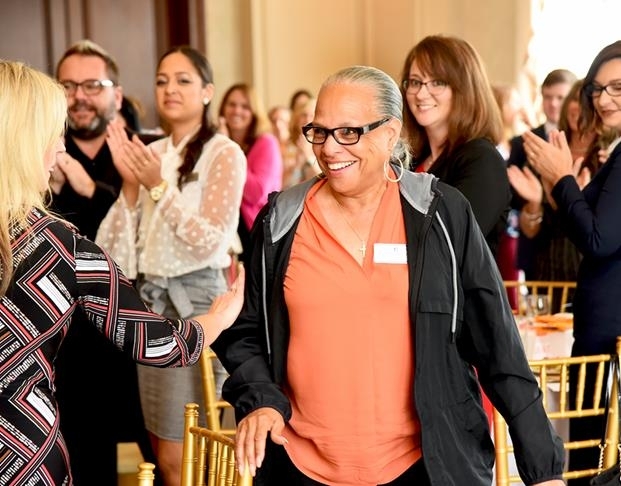 HIGH POINT — On a day that carried the theme of empowering women, High Point leaders from the business world and across the community celebrated one of their peers Tuesday for her accomplishments and compassion for others. Reneece Huntley was honored with the 2018 Businesswoman of the Year award at the Business High Point-Chamber of Commerce annual Women’s Business Luncheon. Huntley, administrative assistant to High Point Police Chief Ken Shultz, beamed with surprise as she accepted the award — which had been a closely held secret — before a packed banquet room at the High Point Country Club. Shultz said he nominated Huntley, an 11-year veteran of the police department who previously served 26 years in the U.S. Air Force before retiring with the rank of master sergeant, in part for her efforts providing advice and counseling to female employees of the department. An active member of Saint John AME Zion Church in Thomasville, Huntley said she nominated another person for the award, but “never in a million years” did she think she would be a candidate for it. Shultz noted in his nomination of Huntley that her professional accomplishments included ensuring smooth transitions upon the retirements and hiring of two police chiefs during her tenure. She has served several terms as the president of the High Point Citizen’s Police Academy Alumni Association, a nonprofit group that works to support officers. “This is especially important when considered in the light of the challenges and scrutiny that law enforcement officers have faced over the past several years,” Shultz wrote in his nomination of Huntley. Her other community service includes the United Way Grants Allocations Committee, Habitat for Humanity, the city of High Point Honors Team, High Point Clean Sweep and Operation Inasmuch.